My facial cleanser of choice has always been from Hada Labo. It is an affordable brand which you may easily locate at drugstores like Watsons / Guardian in Singapore and Malaysia. So far, I have tried the Gokyujun Super HA Hydrating Cleanser, Tamagohada AHA+BHA Exfoliating Wash and Shirojyun Arbutin Whitening Face Wash and am happy to say that none of them disappoint. I love how gentle the cleansers are and the softness of my skin after each cleansing. On the topic of cleansing, Bioderma Sensibio H2O Micelle Solution is my makeup remover of choice. Whilst it's definitely not the cheapest option available, I love how gentle and effective it removes makeup (including eyeliner - but do be aware for more stubborn mascara, would still recommend an oil based remover). My skin always feel refreshed thereafter, and to tell you a little secret, sometimes I just removed my makeup with this and go straight to bed especially after a long day at work. Next up must be the least raved product on my blog. 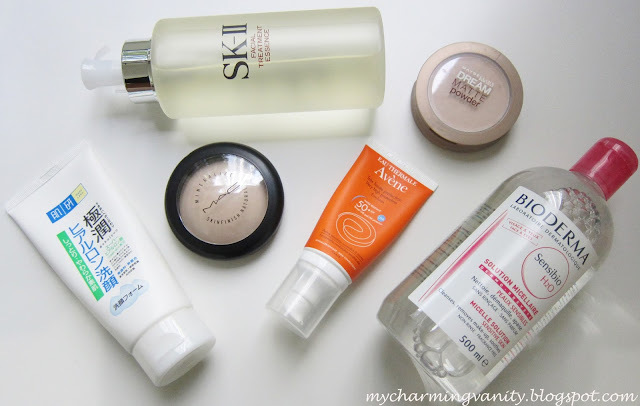 The Avene Eau Thermale Emulsion has been my go-to sunscreen of choice for the past 5 - 6 years. I always repurchase this without fail after completing each bottle. It is so effective that my face literally stayed fair even when I went on beach vacation for a couple of weeks. Likewise, this can also be easily found at Watsons / Guardian at an affordable price. Last but not least, what would a top repurchased products post be without my trusted Maybelline Dream Matte Powder and MAC Mineralized Skinfinish? Both pretty much serve as my finishing powder and I always alternate between the two depending on the type of look that I'm going for or the foundation that I'm pairing it with. I love the former for daily work as it helps my skin stays matte throughout the day while the latter is mostly for weekends or when I'm too lazy to put on any foundation / base. That concludes my Top 6 Repurchased Beauty Products for now. I'm sure this list will expand further even as I try out more products. If you are on the lookout for new products to try, you may also give the products mentioned above a shot and let me know what you think about them!